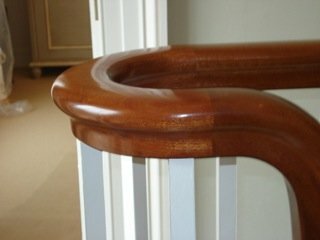 To handcraft and install a bespoke wooden staircase for our residential client in Mid Norfolk comprising a straight flight staircase and hand carved wreathed handrail. The piece was made to measure to the client’s specific requirements. 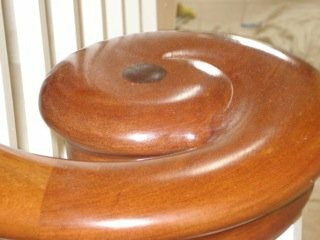 Working in soft Tulip Wood for the staircase itself and Sapele hardwood for the handrail, the softwood was then hand finished with a paint coating and the hard wood finished with French polish. The staircase featured a cut string stair and brackets, whereby the upper edge is cut away to reveal the profile of the treads when viewed from the side. 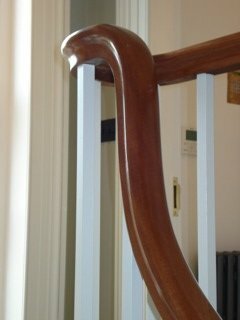 The string had to be curved at the top of the flight of stairs to exactly match the curve of the handrail. 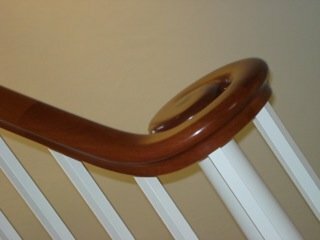 The decorative volute endpiece of the handrail was shaped and finished by hand in Sapele hardwood, a process that took three days. The ornament was capped in American Walnut, a traditional decorative technique used to hide the fixing beneath.